FILE - A Lego model of the White House, one of 56 Lego gingerbread houses, one for each state and territory, is displayed in the State Dining Room at the White House during a preview of the 2016 holiday decor, in Washington, Nov. 29, 2016. The assignment for this year's White House holiday display came with a tight deadline. A team of Lego master builders, within 2 1/2 weeks, had to create 56 unique gingerbread houses out of the toy bricks, one for each state and U.S. territory. For this group, it was child's play. The seven masters at the U.S. headquarters of Lego Systems in Enfield had them designed, built from more than 200,000 Lego pieces and in a van to Washington in time for the unveiling. "We had an all-hands-on-deck kind of thing," said Paul Chrzan, one of the master builders. "We basically gave ourselves a day for each house. And we just built like crazy." The team prides itself on building just about anything out of Lego bricks, including, among other recent projects, scenes for The Lego Movie, a replica of Rio de Janeiro for the Olympics, and a life-size statue of Red Sox slugger David Ortiz. Promoted to the highest ranks for their skills, the master builders fulfill a marketing role for the Denmark-based company, but also see themselves as inspiring young builders. 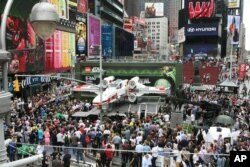 FILE - Thousands gather in New York City's Times Square to watch the unveiling of a 1:1 replica of the Lego Star Wars X-wing Starfighter, May 23, 2013. Some, like Chrzan, 55, had a Lego affinity from childhood, when his Danish mother was among the first in his neighborhood to buy the sets. Others did not play with Lego as much as kids, but studied sculpture or fine arts in school. All see the toy brick as a medium for artistic expression. "For each one of us, it's a unique journey," he said. "The secret to my success is I drew a lot and I built a lot." While children and adults alike are awed to hear about his work, he said it is a job, with real deadlines and customer expectations. He said he keeps the stress in perspective by remembering a zinger from a retired colleague's wife who told him after a rough day: "Oh, Steve, what's the matter, did you run out of yellow brick today?" Donner said he builds with Lego even after finishing his day's work. In addition to building with his two daughters, he has his own side projects. "I have access to the biggest Lego collection in the world," he said. "Why wouldn't I utilize that?"